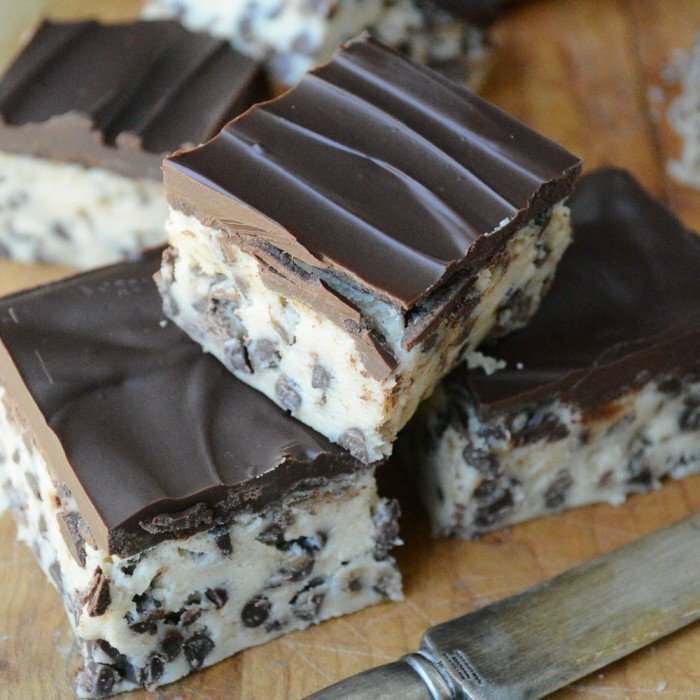 No Bake Chocolate Chip Cookie Dough Bars ~ an easy no egg recipe for cookie dough lovers of all ages! *NOTE: The FDA has recently warned that while it is unlikely, eating raw flour can make you ill, therefore they recommend against eating raw cookie dough or other products made with uncooked flour. I consciously try to keep things jumping here at TVFGI, I never want you to get too comfortable, and I certainly don’t want to be predictable…just when it seems like I’m all about fresh summer salads and grilled fish, I’ll throw some cookie dough at you. Keeps the taste buds on their toes. Ha! I’m acting like this was a rational choice…rather these bars called out to me from the pages of Pinterest and I was a goner right from the start. I’m not sure what it was that snared me…probably the cute speckled dalmatian pattern that those mini chips make in the dough, or those waves of pure chocolate on top, or maybe it was just the name…chocolate chip cookie dough bars…it rolls off the tongue and leaves you with an irresistible craving. 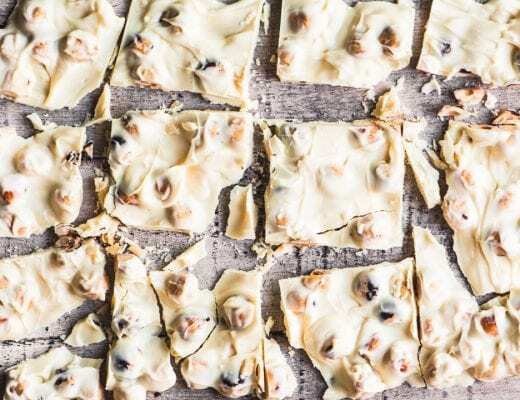 When it comes to raw cookie dough I’m a big coward — I never touch the stuff, so these eggless bars have a little bit of an illicit appeal for me. Cut them in small pieces, they’re rich. The bars are best kept in the fridge until ready to serve, and best eaten while still chilled. The texture will be like fudge when chilled, but will soften as it sits at room temperature. If you are concerned about eating raw flour, check out my recipe for NO BAKE PEANUT BUTTER CHOCOLATE CHIP COOKIE DOUGH BARS, where I share a method for pasteurizing your own flour. Cream the butter and sugar and salt together until fluffy. I use my stand mixer, but you don't have to. Just beat it really good so it's light and creamy. Scrape down the sides of the bowl as necessary. Mix in the vanilla extract. Spray a 8x8 square baking pan with cooking spray and line it with parchment paper with long ends so you can lift out the bars for easy cutting later. You can skip the paper if you want to cut and serve them right out of the pan. Turn the dough out into the pan and pat down evenly with your hands. You may want to flour your hands as the dough is sticky. Smooth it out evenly, I used an offset spatula to finish the job. Cover and refrigerate until firm, (about 4 hours) or even overnight if you like. The texture will be similar to a fudge. To make the chocolate topping, put the semi sweet chocolate chips in a microwave safe bowl or measuring cup and microwave for one minute. Stir, and then return to the microwave for short bursts of 15 seconds until the chocolate is totally smooth and melted. Don't over heat. 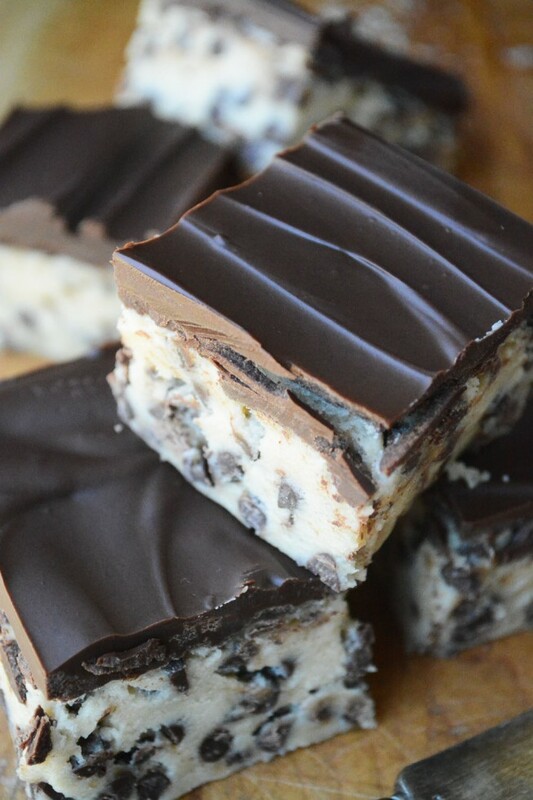 If you love cookies and cream, try my NO BAKE COOKIES AND CREAM COOKIE DOUGH BARS. Love chunky cookie dough? 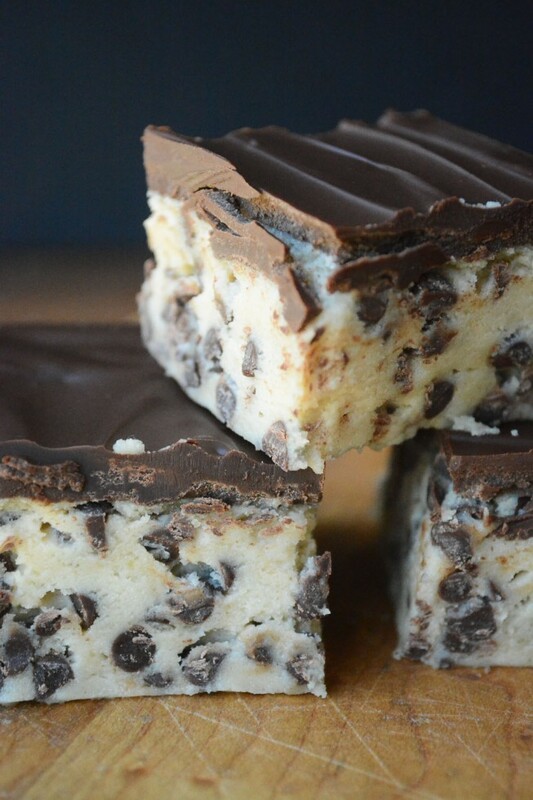 I’ve got you covered with I WANT TO MARRY YOU COOKIE DOUGH BARS. 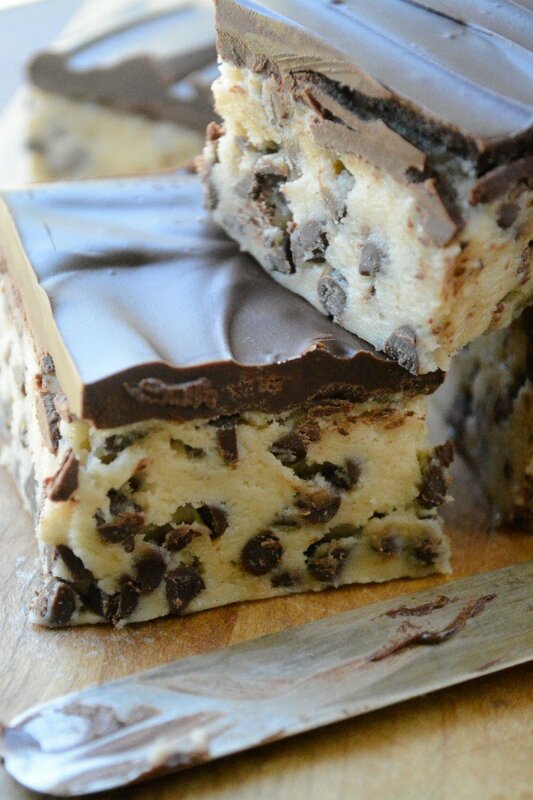 don’t forget to pin these no bake chocolate chip cookie dough bars! I followed this to the T, used condensed milk, not evaporated milk, and it still won’t set after 8 hours. The texture should be like a soft fudge, Melissa. It’s possible you used more condensed milk than I did, I purposely didn’t use the entire can. If you try them again, use a little less and your finished product should be firmer. Can you make this without condensed milk? The condensed milk is kind of central to this recipe Lola, not sure what else would work. I just made these and then read the listeria posts, is there any truth behind that? I am 21 weeks pregnant so it worries me and now I’m afraid to eat them ?? and i want to soooo bad ! Unfortunately Amanda, there is a real risk, you can read about it here from the USDA. The risk is very small, but since you are pregnant, you should steer clear of uncooked flour. Could you freeze these? I have a friend who loves cookie dough and I can talk until I’m blue in the face about the chance he’s taking. So I’d love to make these and mail them to him but they’d have to be frozen in order to survive a couple of days in the mail. I think these would freeze well, Cheryl. How about taking crushed chocolate chip cookies and adding the sweetened condensed milk? I know it’s an extra step, but it does solve the flour controversy. That might just work, Rosemary ~ thanks for the idea :) I’ve seen people make Oreo ‘truffles’ like that, so I don’t see why it wouldn’t work here. You used all purpose flour. Isn’t that dangerous? I have seen similar recipes made with the special pre baked flour because of all of the listeria in so much flour issue. I’ve just updated with a warning about that, Mary. I think there may be some pasteurized flours coming out on the market, soon, and that would help! The raw flour issue can be easily resolved … Just preheat oven to 350?F/175?C then evenly spread flour on a baking tray and bake for 5 minutes prior to using in your recipe. Hope you like them, Sinar. This looks great! I plan on making them tonight. Would it be okay to leave in the fridge overnight for 2 days? I need to make them in advance as I do not have the time with my busy schedule! Sure Jessica, that would be fine. These are awesome. After reading some of the reviews I made the following changes with the intention of making a double batch: I doubled everything except the condensed milk, brown sugar, and chips. I used one cup of brown sugar and one can of condensed milk, scraping out the can into the mixer, and 3/4 the bag of chips. I think I will drizzle the melted chocolate chips instead of spreading a layer. Love your website! Thanks for that info ScienceDork, and I’m so glad you like these! HI! I Was wondering if these can be frozen? I’m making some squares for my sisters wedding and these look delicious but I wanted to make them ahead of time! I think this would freeze well, Anna. 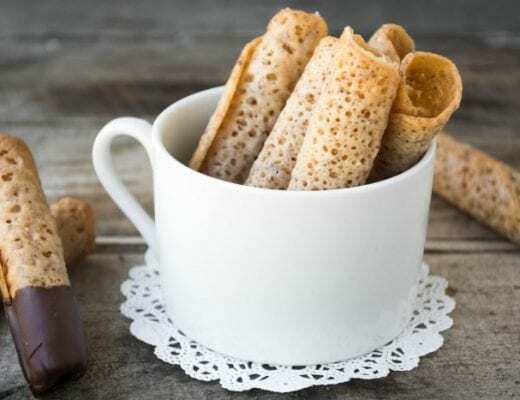 Anyone ever try making these with stevia and at least part whole wheat flour? This sounds scrumptious, but diabetics need no white flour or sugar. I haven’t tried that, but remember that the sweetened condensed milk also contains sugar, so that would also need to be changed. This is obviously something diabetics shouldn’t eat then. YUM!! Who doesn’t LOVE cookie dough? Cookie dough is the best part of making cookies! These look so amazing! These were really very, very good. The only thing different that I did was put 1/2 of the bag of mini chocolate chips in the mix and then melted the other half to put on the top. Being so sweet already I didn’t think we needed that much chocolate on top. I made these for my son who loves cookie dough and he said next time, don’t even put the chocolate on top. To each his own I guess. But, thank you – it’s a great recipe and I’ll be making it again. thanks for the feedback Barbara ~ I liked it so much I’ve done a few variations already! 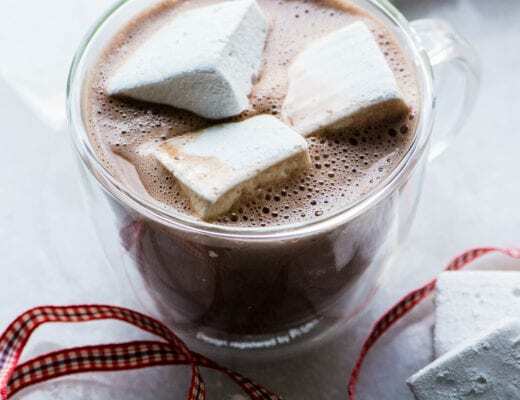 It would be ideal if your recipe didn’t call for using a microwave (I don’t have one), but I’ll just do it the old-fashioned way and melt my chocolate in a double-boiler. Oh of course, Sandra, you can melt your chocolate however you like, and hope you enjoy the bars! I usually use Nestle semi sweet or their dark chocolate chips and I’m always happy with the results, Priti. I’m pretty sure I used the dark chips here. I get Hershey;s over here and they’re terrible. it hardens too fast before I can temper it…but I will look for Nestle’s at Spinneys! The reason raw cookie dough isnt good for you is becuase it has raw eggs in it. This recipe doesn’t so i dont see the harm. Im going to try. Actually, I understand raw flour is a big culprit for food illness. I think that has been debunked, Rose, I did a bit of research and found that raw flour is not harmful, at least according the sources I read. The raw flour issue can be easily resolved … Just preheat oven to 350F/175C then evenly spread flour on a baking tray and bake for 5 minutes prior to using in your recipe. Anyone who says they HAVEN’T had raw cookie dough WITH eggs (and raw flour) is a liar, unless they actually happen to have an allergy to eggs. I practically grew up on the stuff, and I am very much still alive. The only real reasons why you need to stay away from it are A: The aforementioned egg allergy (which is a thing that happens; my mother’s brother can’t go near eggs, or he’ll go into anaphylactic shock), or B: Celiac disease. If neither of these is a health issue, then you’re fine. I’m sure you could Pauline, great idea! I think this would be the perfect tasting cookie dough flavor if it had a dash of salt in it. For me something is slightly off and it’s not the flour flavor others have mentioned. I think it’s salt. You know how when you omit the salt from a cookie recipe they don’t taste quite right? I think that’s the case here, otherwise it’s a great consistency and a super easy recipe that I can see many people enjoying. I used Hershey milk chocolate for the top and a thinner layer because I was worried about it being sickening sweet. I’m glad I did, however I think I’ll stick w/semi-sweet chips next time. Thanks for the recipe! Gorgeous photos captured my attention! Great point, Heidi, I’m going to make a note in the recipe, thanks!! Found this on Pinterest and it could not have been better timed. I’m 21 weeks pregnant and have been desperate for some cookie dough. Being so fast and easy was definitely a perk! They completely hit the spot. I made these several weeks ago and took some to work for a few people… Oh my goodness were they yummy!!! One of the best comments was (while taking his second bite) “this thing owns me right now.” LOL I’d say they were a hit!! I am taking them again tomorrow for a going away party and this time I am using milk chocolate chips for the top. Thanks for sharing this amazing recipe!! I’m so glad they were a hit – I think the milk chocolate will be great! Any info on the calorie content? We loved these …. We cheated and used canned chocolate frosting instead! Wonderful and no worries about melting and/or chilling after frosting !! Just finished and put in the fridge, do I need to wait the four hour before putting the chocolate topping? Also I noticed some said it tasted “floury” and you said be sure to put in the vanilla, guess what I forgot! The beater tastes a little floury but I think it will even out with the topping. I hope. You probably don’t need to wait before putting on the topping, but I do think that they need to be really well chilled and firm to be at their best. Made these for 4th of July picnic. I added red, white, and blue sprinkles to the dough. Also, since I am not suppose to have chocolate, I frosted them with cream cheese frosting. Cookies snd cream bars! That sounds fantastic – I the sprinkles! Do you use milk chocolate chips at all in these? Or only semi-sweet? I used mini semi-sweet chips for the dough, and regular semi-sweet chips for the topping, Darren, but you can use any type you like. I wonder if you can use gluten-free flour in these? I assume you could, Kathy! My grandson said, “These are the best things you’ve ever made, Nonna.” Pretty high praise. But when my husband said the same thing, I knew I really had a winner! Thanks for sharing, Sue. I’m not sure I’ll even bother with the peanut butter/chocolate frosting I’ve seen on other versions. Has anyone tried this with canned coconut milk? Just a thought…..I don’t do dairy- but these look amazing. I’m thinking about making these for my stepdaughters bday party this wkend, but it’s outside and will be mid 70’s. I’m going to look into a different frosting so the chocolate doesn’t melt away, but do you think the rest of the bar will hold up?! I found it was best eaten fairly cold, Rachel. If you can keep it cold and then maybe bring it out from the fridge when ready to eat, that would probably be best. I just made a pan of these and mine are doughy as well! I followed all the ingredients and directions. Also, mine came out tasting a little flour-y. Can I add something next time that won’t make them taste like flour? Well, the thing about these is that they are a ‘play’ on cookie dough, so the flavor is going to be different from a regular blondie or brownie type dessert. I would say make sure you added the vanilla, and also you could try making them in a slightly larger pan so they are thinner, with a bigger frosting to bar ratio. I also would say they are best eaten in small pieces, even though in the photo they look on the large size. The dough shouldn’t be gooey, Rebecca – did you get the right amount of flour in? For me, it was soft at room temperature, but firm when it was cold. I let it sit out for maybe 15 minutes before cutting. I don’t know what could account for your gooey texture, so sorry! And only brown sugar goes in this? No white sugar, right? Rebecca, sweetened condensed milk is Eagle Brand, not evaporated milk. Thanks Mary – that must have been the problem! hi was just reading the notes and noticed you had an issue….you wrote evap milk in your reply. Did you use evap milk because that is different than condensed which is what the recipe calls for? You said you used evaporated milk when the recipe calls for sweetened condensed !! Could be the culprit for gooey dough. I made these today, am just waiting for the frosting to harden before having a sample. I am looking forward to biting into one. Oh my goodness, those are so mouthwatering! I too love that they are eggless. Will definitely have to give those a go soon..
You’ve outdone yourself with these bars, they look absolutely incredible! Looks sinfully delicious! Wonder what it would be like if you added a little flake coconut? These are my kinda treat — wow! The fact that they’re no-bake makes them even more dangerous. Ummm – these should totally be illegal! They just look too good, dangerously too good, like I’d eat 15 in a day too good. Which means I must have them! Beautiful Sue! 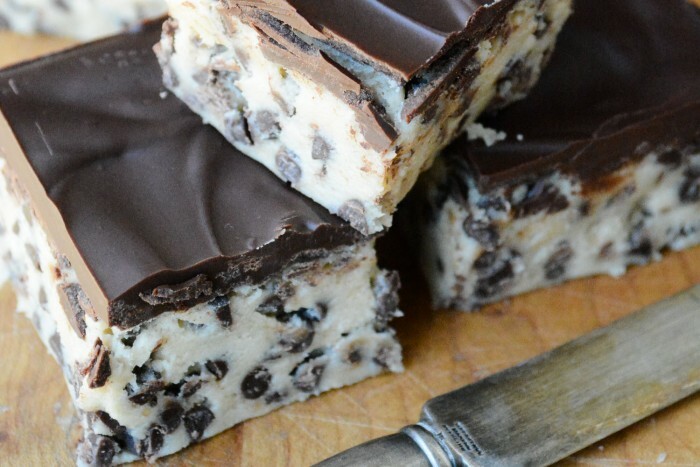 it’s like cookie dough fudge…with chocolate on top! splendid, SPLENDID creation. These look incredibly rich and tempting! This recipe reminds me of my childhood when we got to lick the bowls with the cookie dough. Pinned! These look fantastic! I’d imagine they would disappear quickly no matter where they are. And I love that it doesn’t heat up the kitchen. This takes me back so many years to when I was carrying my daughter. One of my craves was choclate chip cookie dough. I grew up in the 60’s-70’s and this would have been a great hit! Have a great summer Kerri – we’ll cook together! This is splendid, I’m going to have to try making it this week. I can imagine it being very popular with my daughter and her friends. I love how you described them as dalmatian-patterned :) These will be perfect for the chocolate chip cookie dough fanatics in my family! Thanks Susan – I think we all must be hardwired to respond to chocolate chips! I don’t think that eating raw flour is a good idea. I’ve never heard of this, Pamela, I’ll look into it. Put your flour in the microwave for 2 to 5 mins then let cool. That will kill all bacteria. I store flour in the freezer which I believe also kills bacteria. Summer or not, these would be delicious any time of the year! Okay. it’s official. I am ready for my sugar fix intervention ! This brings eating raw cookie dough to a new level! Oh my goodness, amazing! And legal too, that’s a wonderful combination, for sure! Just when I need to go on a diet – you post this gorgeous treat. No bake – cookie dough, chocolate? I am in love! Pinning and sharing! Oh my! I love this idea and no-bake is perfect for summer :) Pinned! Thanks jennifer, have a great weekend! I seen this recipe made with oat flour. You can buy it or make your own by putting 2 2/3 cups of old fashioned oatmeal in high speed blender and pulse until it becomes like fine flour.. It will yield 2 cups. I’m going to try that Gigi, someone else mentioned that and I love oat flour.